Over the years I’ve had quite a few people request this recipe so I thought I should just put it online, especially since I don’t travel with it and need it myself. 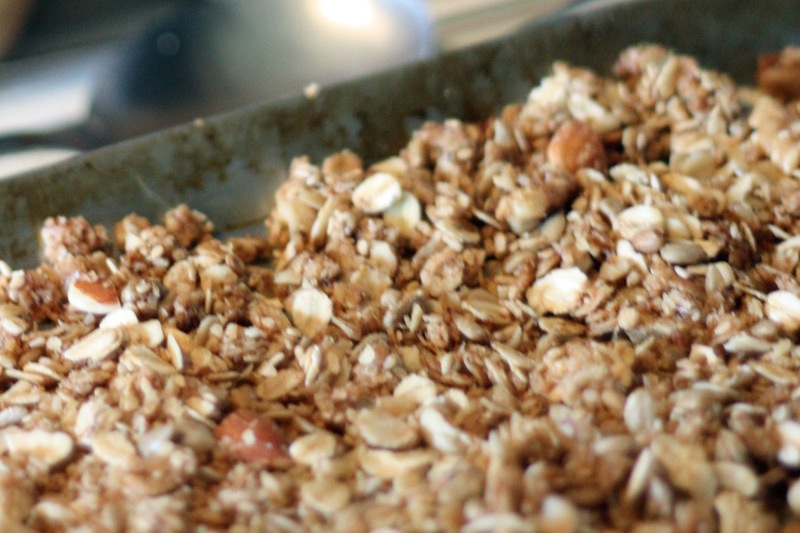 There’s a story behind the recipe – I found it in the More with Less cookbook, and when I started visiting my in-law’s home before marriage they were quite impressed with “Jacob’s granola recipe.” One day while making granola at their house, I looked at the recipe author, and found out she lived one block away and was a friend of the family! Pour this mixture over the dry ingredients, stirring thoroughly until it’s all mixed together. Spread thinly and evenly onto greased cookie sheets, about 3/4″ high. Bake at 325° F, and be careful the sheets are not too close to either heating element. I bake for 15-20 minutes before I check it and mix it around, switching the top and bottom pans around for the last 10 minutes of baking (25-30 minutes total baking time). It’s really easy to burn, so check it often. I allow it to cool in the pans at least 30 minutes so it forms chunks, then I put it in old ice-cream gallon buckets.